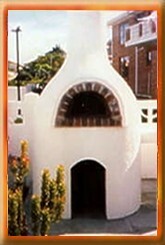 Designer Braai's and Fireplaces can also design, supply and build a pizza oven for you to your specific requirements. 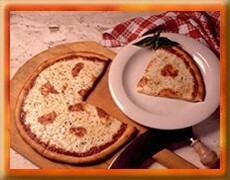 Now you can enjoy the pleasure of home-made pizzas in your own home for a fraction of the cost. Bake your own bread or pizza base. You can even do roasts. Easy to clean...easy to maintain. 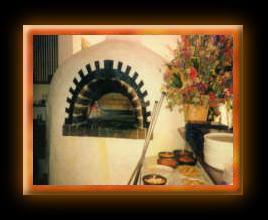 We will build your pizza oven wherever and to whatever shape and size you want it. The "party of a lifetime" is as close as a phone call away. Easy to build...just follow our simple step-by-step plans! Preconstruct base to whatever height, shape and size suits you best. Position the 4 sections of the oven floor and cement them in place. Cement the oven dome in position onto the floor. Cement the oven-mouth arches and chimney base into position. Cement chimney in place. (As chimney height requirements will vary, no chimney has been included in the kit.) Select a suitable diameter pipe from your local hardware store and have them cut it to the length you require. 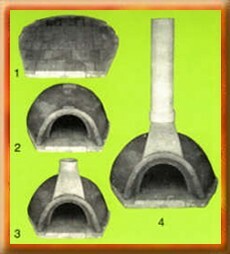 Decorate oven mouth with brick arch. Plaster outside and finish with a good, heat-resistant paint in the colour of your choice.